Ok, so I managed to copy the data into a 2D array. Yet when I use the algorithm on page 269 I get a cross section of the mesh and my computer just hangs and refreshes after a while with the same image.When I sample the data, the cross section becomes even more jagged. Using my reshape causes nothing to be displayed. Have tired a small 5x5 array with lower numbers and it works fine on both functions. Hanging problem has been solved by sampling.cpp that has been uploaded onto MyUnisa. jen8, I'd say you should look to scale in the sampling code that was given us. I did mine there, untill I found my mesh looking normal. > untill I found my mesh looking normal. Just devide the ypt by an integer value before you store it. Asked the lecturer a week ago about glOrth version of myReshape and he said we should use the one on page 267, which uses a glFrustum. Just change the last value (20.0) to (200.0) in both the if and else parts, to get a bigger volume. What options did you use to make the lines not get drawn in front of the meshes? 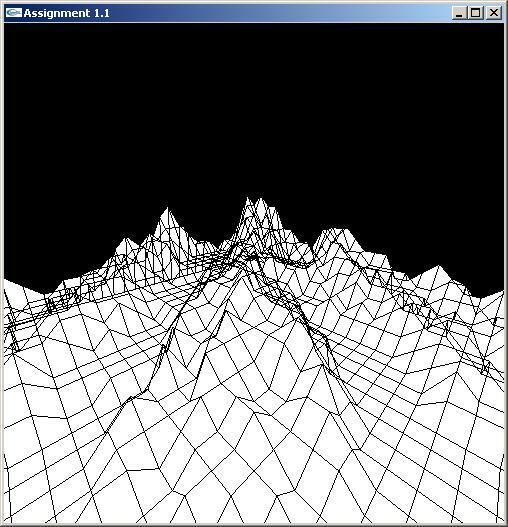 My current program at the moment looks almost exactly the same then yours but I can see my GL_LINE_LOOP lines that should be behind the mountain any insight would be appreciated. Have you used the polygon offset code on page 269? How are you viewing the object? + / - z? What angle of view are you using? > when does this occur? as you reshape your viewport? Sorry I'm using the Fourth Edition of the prescribed book. > How are you viewing the object? + / - z? using glFrustum with a +2.0 on z. > What angle of view are you using? Is it cheating to enable GL_DEPTH_TEST? > > when does this occur? Not meant to be used. > Fourth Edition of the prescribed book. I don't think the book editions are that different. > > How are you viewing the object? + / - z? > using glFrustum with a +2.0 on z. Try zooming out more to see what happens. > > What angle of view are you using? > Is it cheating to enable GL_DEPTH_TEST? it looks better without it. Not meant to be used. Ok, been working on the assignment this week...all seems fine, but I'm not happy with my mesh. Too linear. Why could that be? Thanks for the feedback BenVP! I created a function called DrawHeightMap(bool wireframe) where I first draw all the quads and then the lines and that created the "see through" effect as in the image I posted earlier. as you can see where I made the arrow the back lines, are at the back of the mountain where they should be. Is there any trick or something I can use to get around that? I used the code on page 296, but that did not solve this problem. > that has been uploaded onto MyUnisa.